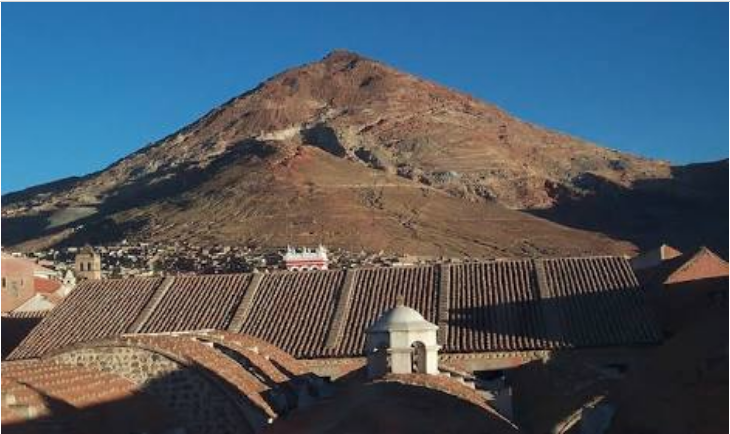 The Rich Mountain of Potosi (Cerro Rico) has been an enormous source of wealth. An old say, worldwide: “It is worth a Potosi” (Vale un Potosi) summarizes its world class! Potosi was larger than New York, had electricity before Paris … and yet … we rad below the sad, real life that those miners had to endure for hundreds of years. When we visited Potosi, we took the “foreigners’ tour” as opposed to the Bolivians’ one. It was said to be more difficult and colorful. So, we did, and until today our family recalls that exploration … even my daughters who were 10 and 11 back then, had to crawl to pass from one place to the next. We went down five levels and heard nor see nothing … not even an ant was seen there. From time to time, a loud shout would signal that an explosion was coming up or miners with a barrel were coming thru and we had to squeeze along the sides, to let them pass. What my daughters remembered the most was the miner we had met, all alone, hammering fiercely into the rock and then scraping the powder with a spoon-like tool. He was preparing the site where he would plant the dynamite. He was doing two tours of 24 hours … so he did not see the sun, ate properly nor was accompanied in the case of an emergency. A very sad reality that keeps us focused: we are indeed fortunate. On top of the above and the story below. This mountain is the central piece in our coat of arms, our national emblem that symbolizes the mineral richness we as Bolivians were fortunate to receive. Another reason, why we should, as a nation, stop all work inside the Cerro Rico. Nowadays, it is not safe for the miners and it is also not safe for any tourist to go. This mountain, after centuries of exploitation, even before the Spaniards showed up, is crumbling and will collapse. Even the UNESCO has been involved, to help the Cerro Rico not to crumble and collapse … however, miners continue to work inside and more accidents happened and more are expected as its many tunnels are subsiding. If you, kind reader, are thinking: what is the government doing about it? nothing in reality is the unfortunate answer. A fierce demagogue government, under the strong “lead” of a coca grower caudillo, who has absolute control of ALL State powers, for the last twelve years, has done little if anything at all! All the way down the cobbled streets of Potosi in the south of Bolivia were tour companies advertising adventures into the labyrinth of silver mines in the Cerro Rico mountain that towered over the colonial city – nicknamed “the mountain that eats men” for the millions of Bolivians who perished inside its tunnels in the 500 years since the Spanish began enslaving Quechua natives and forcing them to mine for silver. These days there was little silver left, but at least 8,000 Potosi men were still working in the mines, bringing out other minerals like tin and zinc. The town, capital of the poorest department of South America’s most impoverished country, had two major industries: mining and mining tourism. Recent studies suggesting that Cerro Rico was on the verge of imminent collapse, due to being so hollowed out, had threatened the livelihood of both these industries. I didn’t generally go in for tours, but… sometimes you just really want to go down a Bolivian silver mine. There was an abundance of tours to choose from, all promising an authentic experience (this is not touristy) with genuine interactions with workers (our guides are ex-miners) and a good travel tale to boot (not for wimps and wossies!). Sure enough, our guide Juan was a twenty-something Potosian who had left the mines to work in tourism. In doing so, he had increased his life expectancy – which hovered somewhere around forty for the miners. Most men (there were no women, but plenty of boys) died within ten years of working in the mines, as a result of back breaking labour and breathing in the toxic fumes of asbestos, arsenic and other carcinogens. A small group of us were driven to a warehouse at the foot of the mountain where we were given yellow plastic coverings to wear over our clothes, heavy boots and hard plastic helmets. We were then taken to the nearby miner’s market to buy gifts for the workers. Juan assured us the miners loved the tour groups coming through as the tourists brought them presents – so we bought an arsenal of useful things like cigarettes and deathly strong alcohol. Later, when we were treading over the shoddy wooden boards loosely covering holes between the mine shafts, Juan told us that most accidents and fatalities in the mines happened when the miners fell down these holes drunk. I suddenly felt very guilty about the plastic bottle of Ceibo he’d encouraged me to buy in the market, with alcohol content listed at 96%. The entrance to the mine was a ramshackle cluster of sheds leading to a gaping hole in the mountainside which plunged the visitor immediately into darkness upon entering. We switched on the headlamps strapped to our foreheads which shone beams of light through the thick, dust-clogged air. We had the option of wearing face masks, but I took mine off as it made it even harder to breathe. Most of the miners didn’t wear masks. The further into the tunnels we got, the higher the temperature rose – until it became stifling and, underneath my hard hat, I felt my hair drenched in sweat. In many places, the roof of the tunnel hung so low we had to hunch over to squeeze between the walls. We moved between levels by clinging to ropes and edging our way down the rock face. Every so often, the rumble and vibration of the tunnel walls signalled the arrival of a mining cart, and we would hurry out of the way as it hurtled through the passageway along rails on the floor. Juan led us to a dead end where, in the narrow space between the walls, three miners were bent double, packing sticks of dynamite tightly against the rock to prepare for explosion. Our guide indicated that we should give them our gifts, so we handed over coca leaves and cancer sticks. In return, they posed for our expensive cameras and we gawked at the place where they spent at least 12 hours a day in horrendous conditions and toxic fumes, trading years of their lives for a paltry salary. They pointed to the most treacherous parts where the walls had fallen in, so we could take photos of those too. On our slow crawl out of the tunnels, we stopped at the shrine to El Tio, which existed in every mine in Cerro Rico. With a name that translated to “The Uncle”, Tio was a devil-like statue, life-size and all in red with horns and covered in colourful streamers. A clump of coca leaves on his lap almost – but not quite – hid the oversized phallus that peeked through. He was surrounded by cigarettes and bottles of Ceibo, offerings from the miners to appease him so he would protect them underground. He wasn’t doing a great job of that, as accidents were rife. We rested on the wooden benches beside the Tio statue and gave the remainder of our gifts to the miners taking a cigarette break in the same spot. One took the bottle of Ceibo and opened it, sprinkling a little on the floor in front of Tio before pouring a capful for himself. The cap was refilled and passed around. When it came to my turn, I took a tentative sip and the burn of alcohol ripped down my throat. Feeling sick, I quickly passed the cap on. Another miner scattered coca leaves on the ground and then grabbed a handful and shoved them into his cheek, mashing them into a ball with his tongue. All of them assured us that they liked having us there, but I wasn’t convinced. We left the mines a couple of hours after we’d entered, stumbling blinking into the sunlight and gasping at the dust-free air. It was still only the middle of the day, which meant the miners would be down there for another six or eight hours, then another six or eight years after that. And even though we justified our little jaunt into the mountain as necessary to raise our awareness about the horrific working conditions within, I sincerely doubted any of us would do anything substantial with this newly acquired understanding of Bolivian poverty.